Depending on the project, teams think and speak in wildly different ways. This can lead to communication challenges, especially between departments. One illustration of this is when software teams and content teams must unite to deliver a functional website that dovetails with the text and images. Proper documentation helps ensure that these disparate groups are aligned in delivering a quality product, where everything needed from each department is outlined. Today we’ll talk about one such piece of documentation known as the creative brief, which pertains to the creative team, agency or designer. The creative brief helps creative teams understand their part in the larger project and, in so doing, better shape the overall strategy, goals and tools for the project. A creative brief is a short, one-or-two page document that is used by the creative professionals on a project for guidance when making creative deliverables. These deliverables can include visual design, copy, advertising, websites and more. 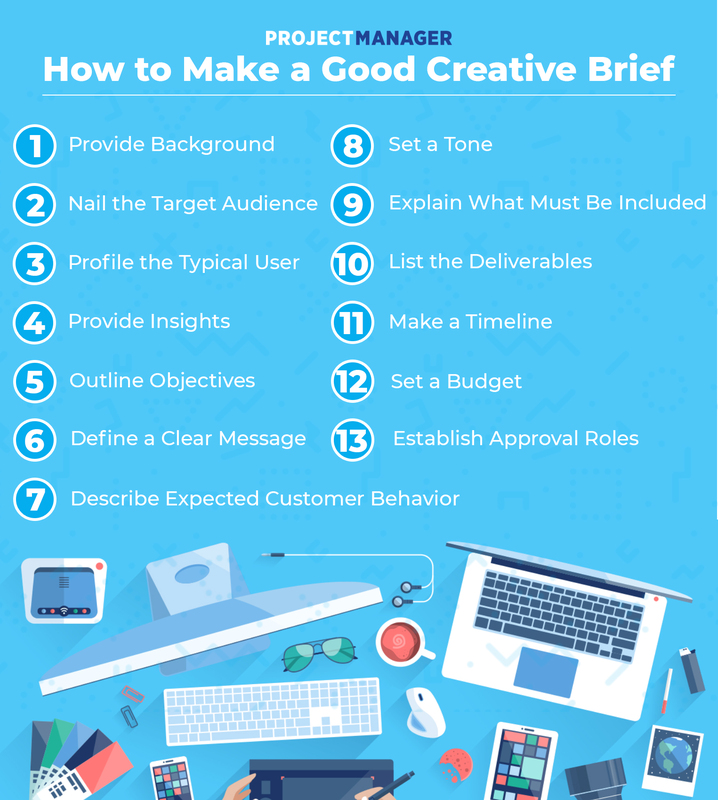 The creative brief is most often written by the requesting party (like someone on a marketing team) and is approved by the creative team, be they designers, writers, et al., and the project leader of these teams. The creative brief is like a blueprint for the project to help the creative team know what they’re responsible for and how it fits into the larger project. Therefore, it’s also a key element to any overall strategy and project goal. The value of having a creative brief is that it sets out to make sure that deliverables meet expectations and business needs. Because of its clear value to project management, creative project managers typically employ them for each project. Yes, a creative brief is one more task, but it’s an essential one. If you have a well-made-up creative brief at the front of your project, you’re less likely to have problems as you progress through the life cycle of the work. Just because they are highly effective, doesn’t mean that creative briefs are present in every instance of project planning. Surveys of ad agency executives have shown that many of the creative briefs used are not clear, and can be incomplete or inconsistent. To avoid these shortfalls, the creative brief should be written after a client explains their expectations. Then the creative team can comply a list of questions that are answered by the requestor, usually a marketing team leader. The answers to these questions will become the template for the creative brief and the whole creative execution of the project. As the project moves forward, the creative brief is always referred to, and any deviation can be identified and addressed. Adding too much information to a creative brief is a common mistake. While the creative team should know all there is about the product or service being developed, this is a creative brief—emphasis on the brief. The brief must be short and to the point; there are supporting documents for the details. The client interview is critical to a successful creative brief. They are, after all, the ones who know what they want from the project. The creative team needs to have clear communications with the client, and before any creative brief is executed, it must be approved by the client. Don’t neglect the work and research before the creative brief is written. Some parts will be easier to develop than others, such as the deliverables and schedule, which are clear from the start. However, the target demographic might take more time. Be sure to give those parts of the creative brief their share of time to get it done right. Creative briefs that are problematic were probably rushed, so take your time when researching and writing one. Also, once it’s completed, don’t just let it sit with the creative team. Yes, they can come to you with questions, but it’s best to be proactive and keep the human interaction present. Be available for the creative team to ask questions through the project life cycle. A creative brief can be made in many ways, from a Word document to a PowerPoint presentation or PDF. There is no single way to write a creative brief, but all need to supply certain pertinent details. Whatever those details might be, the creative brief should inspire the creative team to understand the emotional feel of the work and its tone, as well as direct with more measurable data, such as target market and objectives. Finally, the unwritten rule of any successful creative brief, or anything really, is to remove ego from the process. Being open to feedback is critical. That said, the typical creative brief may have the following information. Background: This includes the client and their contact information, the name of the project, what it is and why it’s being done. Target Audience: Who is the target audience? What do they think about the product or service you’re developing, and is there anything that the creative team should avoid? Also, note the competition. Profile of Typical User: It helps to have a very clear picture of who the end-user is when developing something for them. This leads to good customer development. Insights: What are the key insights that have been learned about the market, and how does that relate to the company, brand or product? Objectives: Outline what it is that needs to be accomplished, how it’ll be measured and what success will look like. Message: Have a clear, simple and single message to tell the target audience. How will they believe that message to be true? Customer Behavior: What behavior do you hope to elicit from customers? Do you want them to trial, purchase or recommend the product or service? Tone: The voice is critical to success and must be tied to the target audience and their values, so decide if it’s serious, light, humorous, etc. What Must be Included: If there are elements that are required, such as logo, address, phone, etc., then list them. Deliverables: List how to deliver the message to the audience and what the best way to do that is. Timeline: Have a schedule to note when something is needed, when it must be done, how many revisions can be fit into that timeframe, etc. Budget: What is the financial commitment to developing this project? Approval: Who is responsible for making approvals and decisions related to approval? Its challenge to the creative team was to remind people what makes Coke special. The brand idea they wanted to deliver to their target audience was that Coke is the genuine taste of happiness. To support that, they listed that Coke is delicious, refreshing, but it won’t resolve world piece or restore the ozone layer. Therefore, the tone was honest, intimate and personal, being friendly, joyful and uplifting. With these signposts to lead the creative team, they developed this eye-catching video. It’s remarkable to see how an outline can be filled in so dynamically with the right creative team and the proper direction. The creative brief is one of many essential documents that help with the planning of a winning project. ProjectManager.com is a cloud-based project management software that helps you plan, track and report on every stage of the project’s progress. It offers kanban boards and a collaborative platform for teams to work together more productively and provides managers with real-time data, so they know exactly where the project is at any time. See how it can empower all your teams by taking this free 30-day trial. The post A Step-by-Step Guide to Creative Briefs appeared first on ProjectManager.com. Next Avira Techblog: Want to Turn Your Side Project Into a Full-Time Business? Here’s How This Man Did It.